BetSoft has created one of the most visually entertaining titles we’ve ever seen in Birds!, with 3D technology utilised to create an eye-catching game, released in time with The Angry Birds Movie. Best casinos to play BetSoft's Birds! The flock of zany looking birds featured in this title seem to be a lot happier than their Angry Birds inspirations. They also all fly away on every turn instead of the symbols spinning, which we would normally see. Additionally, if you score a win the winning bird combinations will fly away and new birds will fly into their place. Birds! features 5 reels, featuring 25 paylines, and coin sizes range from 0.02 to 1.00 – the minimum bet available is $0.50 and the maximum bet is set at $125. Additionally, the RTP ranges between 95% and 96.5%. The base game features a collection of streets as the backdrop, with two telegraph poles sitting either side of the reels. There are three electrical wires between the two which the birds sit on and this makes up the 3 rows format. The backdrop changes to different landscapes when you trigger the bonuses, with each tied in with the theme and executed well with the 3D graphics BetSoft are renowned for. Each bird has been created with their own personality and they all have their own payouts. There are no other symbols other than the birds, but these guys are incredibly animated and the innovative inclusion of making them fly off on every spin is incredibly fun. However, if you’re internet connection is slow it may take a toll. There’s also a ‘Tweet’o Metre next to the reels and we will explain its function below. The bet size adjuster, spin button, max bet option, Double Up (gamble feature) button, and AutoPlay control are all located under the reels too. As we detailed above, the only symbols on the Birds! pokie are the quirky and animated birds – no other additional symbols are included. There’s 10 standard bird symbols, with a win scored by spinning at least three of the same birds. The payouts are dependant on your bet size, so adjust the coins and bet level and then view the paytable in the top right hand corner to view the pays. Birds! has a feature similar to the Cascading Reels feature we’ve come to love, with the birds of winning combinations flying off and replaced by new ones. This essentially gives us a free Re-Spin every time we win. 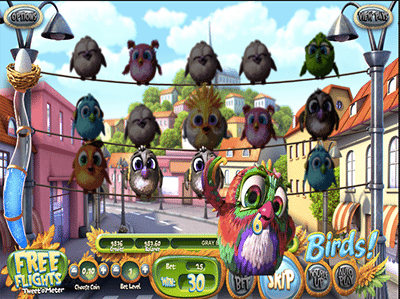 The main feature to Birds!, however is the Free Flights feature – the Free Spins bonus round – which is triggered by the Free Flights Tweet-o Metre. This metre increases on every win, and since you get a free Re-Spin on every win you can quickly fill it up. You just need four free Re-Spins in a row to trigger it, but if you get more you will earn even more free spins. The best part is during the Free Spins the metre remains active and if you consecutively continue to win you will re-trigger more free spins – up to an unlimited amount. The backdrop of the game during the free spins transforms too, which only adds to the exciting ambience. 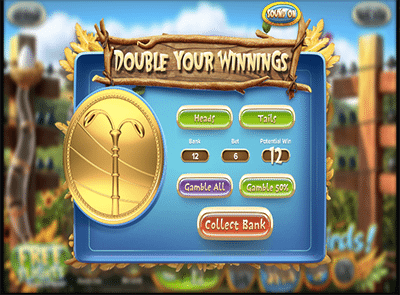 BetSoft have once again included the Gamble feature, which they call the Double Up Feature, and this time have chosen to keep it simple with a coin and the option to pick Heads or Tails. This will double your winnings if you do win, but you will lose it all if you don’t. Interestingly, BetSoft have added a nifty option to gamble just 50% of your winnings so if you do lose, you have still won something. Birds! definitely got our attention from the moment we opened the title. The birds flying away on every spin is initially a fun feature, but it can become annoying – there is the option to press ‘Skip’ where the ‘Spin’ button is though, so you can speed them up a little. This is the only drawback to the game. We especially love the fact you get a free Re-Spin on every win and you can trigger the free spins feature by scoring free Re-Spins. Once we triggered the Free Flights feature, where we were awarded eight free spins, we managed to re-trigger it twice, and scored a huge payout. Birds! is a great title by the 3D pioneers, BetSoft, and you can play it on your smartphone, tablet, laptop or desktop at our recommended casinos in the table above.